A newsletter software is a specialized mail client sending email messages to a contact list. Each subscriber gets an unique email which can be personalized using the contact database. It also includes additional features, for example automated subscriptions using a web form. Maillist Controller is software product for Windows PC and not a hosted online service. It enables you to send email newsletters directly from your own computer without using an expensive web service. All you need is an email account (hosted or from your own server) and a regular Windows PC. Arclab MailList Controller is the complete solution for newsletter mailings and email marketing campaigns. Test drive our software or use the free version as long as you want. There is no registration required. 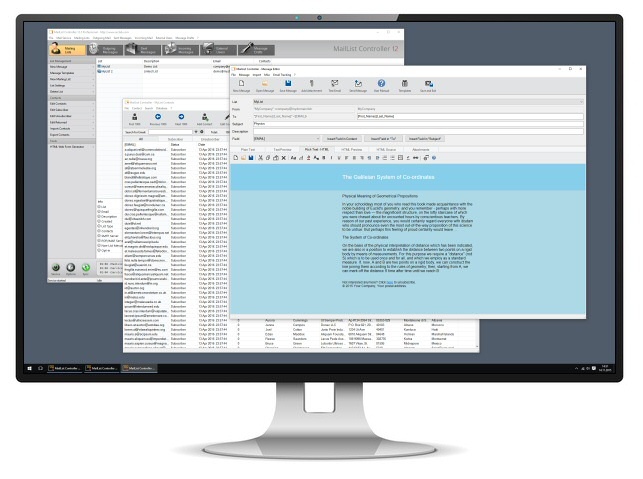 MailList Controller includes all features required for a successful newsletter service or email marketing campaign and covers every aspect of modern mailing list management. It's easy to setup, but has powerful features. The fast and reliable SMTP engine works with any email account and SMTP server. 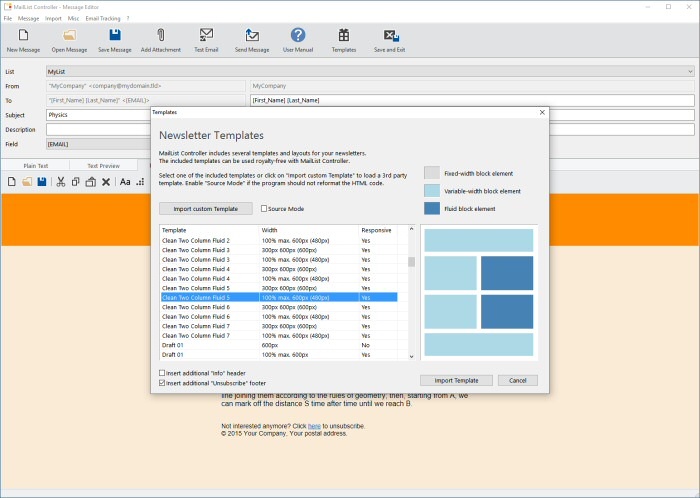 Use the built-in WYSIWYG message editor to compose personalized rich-text (HTML) email newsletters in MIME format with an alternate plain-text part. You can import HTML files, edit the message in an external HTML editor, add inline images and file attachments to your newsletters. The included (responsive and static layout) newsletter templates can be used royalty-free with MailList Controller. Your contact list is a valuable property. MailList Controller helps you to build your contact list or manage your existing lists. It does not make much difference if you have just started or already have a large customer database. Everybody can use our newsletter software and profit from its results. Convert your visitors into subscribers using a web form, which could include custom fields for additional data. The subscription process runs without user intervention and supports single and double opt-in subscriptions. Send newsletters and make customers out of your subscribers. MailList Controller is a "real" software product for Windows PC, notebook or server which allows you to send newsletters and email campaigns from your own computer without using a SaaS provider. Your subscribers contact information is stored on your computer, giving you complete control over your data. MailList Controller is an easy way to communicate with your customers and friends. Email marketing software is very cost effective - it allows you to reach thousands of potential or returning customers for virtually free. Build a close relationship with your customers and see the effort of your email newsletter campaign immediately. Just press a button and your newsletter goes out to your subscribers. Our newsletter software targets 3 different groups and is available in 4 versions. The free and light version for private users or small groups. The professional version is for the business and professional user, who wants to build a closer relation to his newsletter subscribers. Our flagship software product is the eXtreme version, which is the right choice for dedicated professionals and companies with a large customer base. Import contacts from Text (CSV), MS Excel, MS Access, MySQL, MS SQL or other database using an ODBC connection to your list. The alternate list mode "Linked List" queries the contacts directly from an external database without prior import. MailList Controller does not have high requirements. It can be used with any SMTP email account: use a hosted mail account, an account from your own domain or your company's mail server. 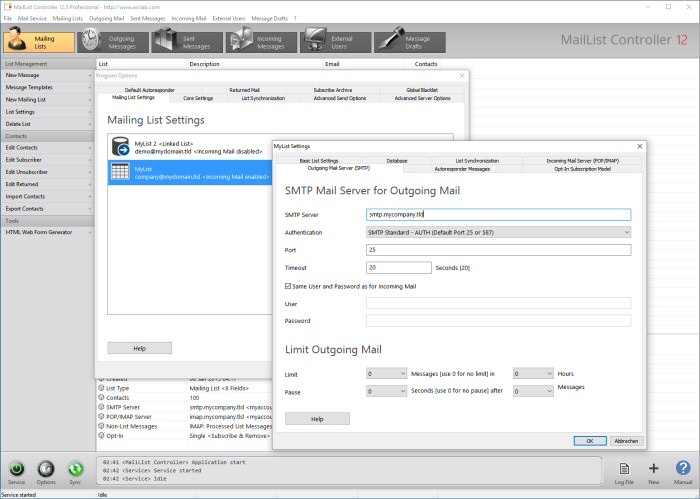 The built-in mail service has a fast SMTP engine and supports SSL/TLS encrypted connections, but will not overload your mail server or account. It contains different options to adjust the mailing speed depending on your environment or mailing limit. You can setup a pause after sending out a specific number of messages or limit the number of outgoing messages sent within the specified time. The alternate "IIS Pickup Folder" mode can be used to bypass SMTP when running your own mail server.